That's what I've been doing wrong with my fancy dress party costumes, I don't do the dramatic face reveal when I walk in the door! Sure having a squad of police pointing at you helps add 'edge', but if I can get the remove mask, icy stare, don't blink thing down, the rest should just snap into place. 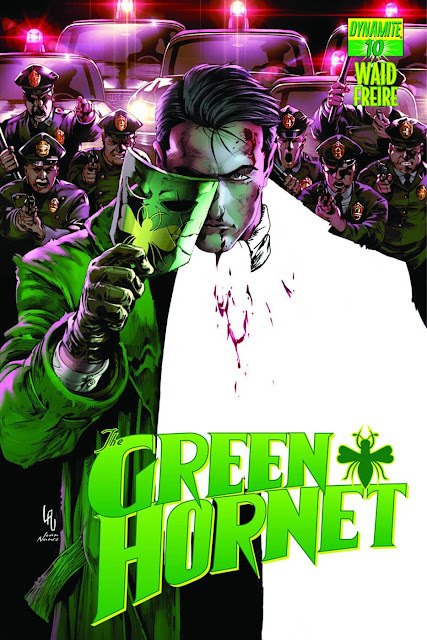 This issue: The dragnet is closing around the Green Hornet--in no small part because crusading radio journalist Britt Reid is leading the hunt! But--isn't Britt Reid the Hornet...? It's a world in which the great heroes of our stories live in the flesh. We start in the Big City, protected by Vampirella and the Green Hornet. A scarlet clad woman of mystery rushes into a bar, pursued by a team of assassins. The terror that breaks loose there and then will eventually lead (in the issues that follow) to The Phantom's Jungle, Flash Gordon's space age town of Landing, battles in the sky with Captain Victory, and so much more. Trevor Richmond is a Wall Street investor who embezzled millions and is about to tank the economy. Again. Desperate to avoid the consequences for his actions, he goes to Expedited Services, Inc., which offers to help him disappear and enjoy a life of leisure in a new life. But what exactly is this new life, how much is freedom worth, and what happens to the old life when someone else shows up to claim it? Dead End is a villain through and through with no intentions of serving anyone. What makes Dead End so great is his self-aware humor and biting sarcasm -- the mark of a true evil genius. Hard to hate and even harder to kill, Dead End is an eloquent psychopath who fights for something better than justice: himself. What do you think? 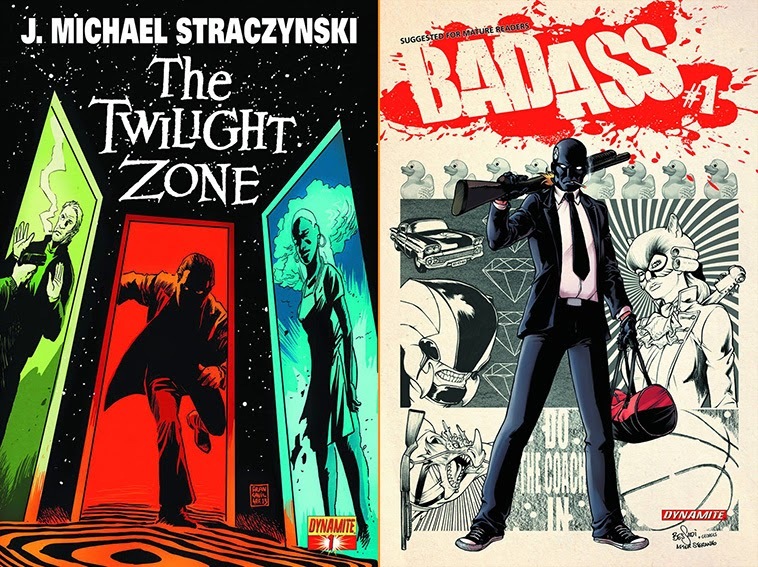 For Dynamite's full January 2014 solicitations,click the jump! I'll probably wait a few issues, but the Legendary really intrigues me. 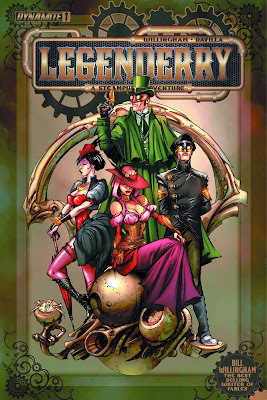 There's not enough good Steampunk alternatives out there, emphasis on the "good". 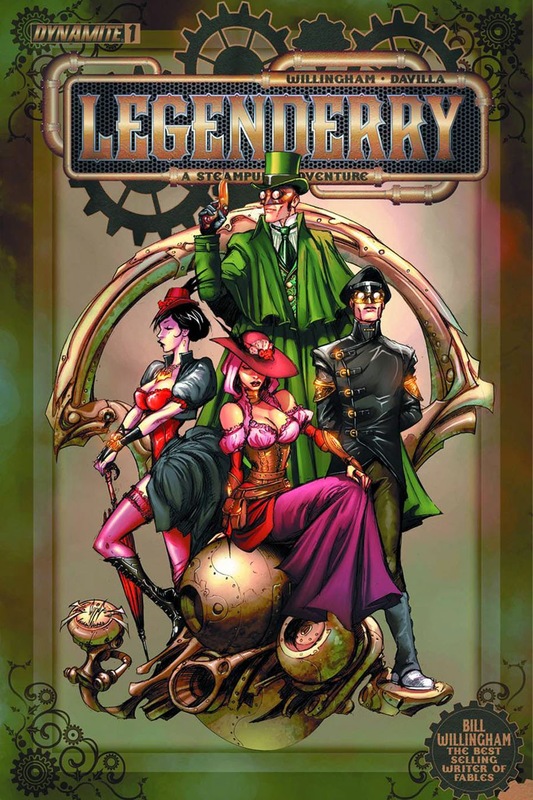 I love Lady Mechanika but holy crap he makes BKV look fast. Look how long it took to get Neil back on Sandman? But maybe now that he's back in the comic writing world, it might be something he'll take a look at. The Green Hornet movie sucked like a White House intern, but looking forward to this comic - I just think the whole concept of him needs a total reboot from the ground floor up if he wants to compete with the likes of Batman and the Phantom. Has there ever been a Twilight Movie comic before? Sounds good. I'm not sure if Twilight has had a comic Karl, probably, but I think this is the first Twilight Zone one. Could be wrong on both counts, I'm too busy having flashbacks of staying up late to watch the original TV series!